Theoretically, the Higgs boson solves a lot of problems. Theoretically, this Higgs boson is a problem. Greetings from the good ol’ U.S. of A. Now that Fall is here, classes are going, holidays are wrapping up, and research programs are in full steam. Unfortunately, all is not well in the Wonderful World of Physics. To refresh, back on 4th of July, the LHC experiments announced the outstanding and historical discovery of a new particle with properties consistent with the Standard Model Higgs boson. No doubt, this is a fantastic feat by the experiments, a triumph and culmination of a decades-long endeavor. However, there is deep concern about the existence of a 125 GeV Higgs boson. Being roughly 130 times the proton’s mass, this Higgs boson is too light. 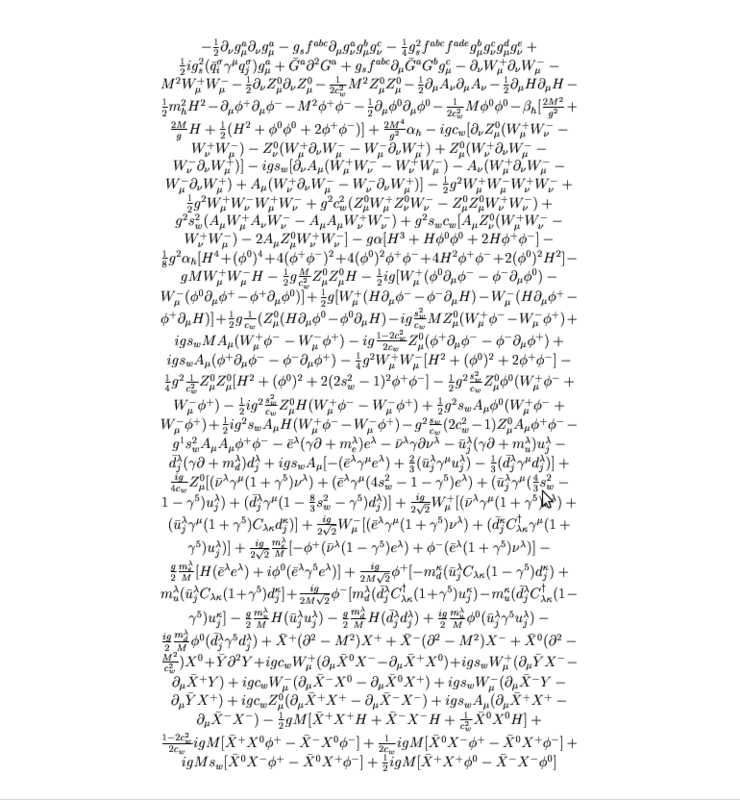 A full and formal calculation of the Higgs boson’s mass, according to the theory that predicts it, places the Higgs mass pretty close to infinity. Obviously, the Higgs boson’s mass is less than infinite. So let’s talk mass and why this is still a very good thing for particle physics. For an introduction to the Higgs boson, click here, here, or here (This last one is pretty good). The Standard Model of Particle Physics (SM) is the theory that describes, well, everything with the exception of gravity (Yes, this is admittedly a pretty big exception). It may sound pompous and arrogant, but the SM really does a good job at explaining how things work: things like the lights in your kitchen, or smoke detectors, or the sun. The first term is pretty straightforward. It expresses the fact that the Higgs boson has a mass, and this can represented by the Feynman diagram in Fig 3. (below). As simple and uneventful as this line may appear, its existence has a profound impact on the properties of the Higgs boson. For example, because of its mass, the Higgs boson can never travel at the speed of light; this is the complete opposite for the massless photon, which can only travel at the speed of light. The existence of the diagram if Fig. 3 also tells us exactly how a Higgs boson (denoted by h) travels from one place in the Universe, let’s call is x, to another place in the Universe, let’s call it y. Armed with this information, and a few other details, we can calculate the probability that a Higgs boson will travel from point x to point y, or if it will decay at some point in between. The second term is an interesting little fella. It expresses the way the Higgs boson can interact with other Higgs bosons, or even itself. The Feynman diagram associated with this second term is in Fig. 4. It implies that there is a probability a Higgs boson (at position w) and a second Higgs boson (at position x) can collide into each other at some point in the Universe, annihilate, and then produce two Higgs bosons (at point z and y). To recap: two Higgses go in, two Higgses go out. This next step may seem a little out-of-the-blue and unmotivated, but let’s suppose that one of the incoming Higgs bosons was also one of the outgoing Higgs bosons. This is equivalent to supposing that w was equal to z. The Feynman diagram would look like Fig. 5 (below). In words, this “new” diagram states that as a Higgs boson (h) at position x travels to position y, it will emit and absorb a second Higgs boson somewhere in between x and y. Yes, the Higgs boson can and will emit and absorb a second Higgs boson. If you look carefully, this new diagram has the same starting point and ending point at our first diagram in Fig. 3, the one that described the a Higgs boson traveling from position x to position y. According to the well-tested rules of quantum mechanics, if two diagrams have the same starting and ending conditions, then both diagrams contribute to all the same processes and both must be included in any calculation that has the same stating and ending points. In terms of Feynman diagrams, if we want to talk about a Higgs boson traveling from point x to point y, then we need to look no further than Fig. 6. In Eq. (1), term on the far left is the Higgs boson’s mass that has been experimentally measured, i.e., 125 GeV. Hence the label, “what we measure.” The term just right of that (the “free parameter”) is the mass of the Higgs boson associated with the first term in the SM Lagrangian (Fig. 2 and 3). When physicists talk about the Standard Model not predicting the mass of the Higgs boson, it is this term (the free parameter) that we talk about. The SM makes no mention as to what it should be. We have to get down, dirty, and actually conduct an experiment get the thing. The term on the far right can be ignored. The term “Λ” (the “cutoff scale“), on the other hand, terrifies and mystifies particle physicists. which comes out inevitably to be infinity. In other words, if the Standard Model of Physics were 100% correct, then the Higgs boson’s mass is predicted to be infinity. 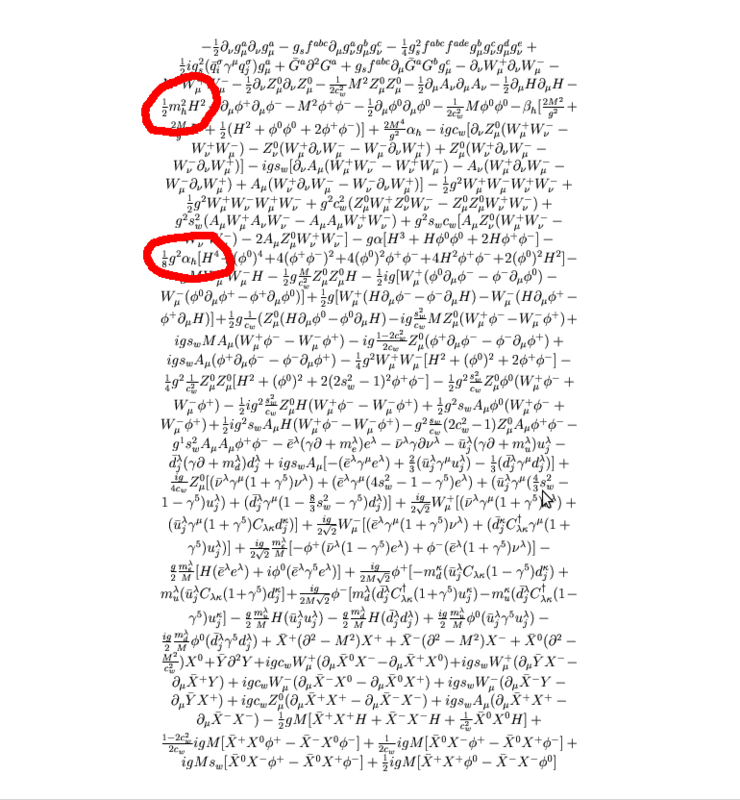 The Higgs boson is not infinity, obviously, and therefore the Standard Model is not 100%. Therefore, the existence of the Higgs boson is proof that there must be new physics somewhere. “Where and at what energy?,” is a whole different question and rightfully deserves its own post.